The holiday season is a wonderful time for families and friends to get together and celebrate. We must not overlook our Tibbie companions and make sure they have a safe and happy holiday season too. Like small children, our Tibbies are curious and are totally unaware of the dangers that might face them. Here are a few things to keep in mind as you prepare for the holidays. Your Tibbie can smell good food a mile away. Be sure to watch those hot containers filled with turkey and ham drippings. You Tibbie can get right under your feet and cause you to trip and spill the hot liquids. Be careful and pay attention to where your pets are when you are preparing those tasty dishes. Don’t feed your Tibbies the cooled drippings. Most seasonings that are tasty to us aren’t good for our pets, plus the rich stock and drippings can play havoc on their digestive system. Even if your Tibbie is giving you the most pitiful look in the world (or act like he is starving), don’t give in and feed them turkey or ham. Our food tends to have a lot of additives and is way too rich for our Tibbies and can cause health problems (i.e. diarrhea). Same thing goes for the fat trimmings… high fat consumption can lead to a bout of pancreatitis. Chicken and Turkey (poultry) bones are extremely dangerous for all dogs. These bones splinter when chewed and can become “glass shards” when in the intestinal track. Simple solution – DO NOT FEED your Tibbies poultry bones. While it might be a good idea for us to have a little “Christmas Cheer”, alcohol is toxic to dogs. It can cause vomiting, diarrhea, difficulty breathing, tremors and depression. So keep an eye on your drinks and make sure your Tibbie doesn’t try to take a few quick slurps. Milk & milk products like Egg Nog and Ice Cream are not good for your Tibbie. This is the perfect time of the year to cook up something special for your Tibbie. Visit “Recipes for Your Tibbie“. Grapes and raisins are very dangerous. These seemingly harmless fruits can cause kidney damage in dogs. Increased activity and visitors during the holiday season can upset your Tibbie’s routine. Try to keep your Tibbie on his regular schedule for feeding and exercise and make sure they have a place where they can go to get away from the commotion (i.e. crate in a quiet room). Be sure to give them a lot of love so they don’t feel left out. It takes only a moment for a dog to crash a beautiful Christmas tree. Trees should be secured in a sturdy stand or anchored to the wall to prevent an accident. Avoid decorating your tree with food items like popcorn or candy. Ornaments can look like toys but can pose a hazard if your Tibbie chews or swallows them. I’ve found it best to not decorate the lower branches of the tree so that my Tibbies aren’t tempted any more than necessary. Other Christmas tree items that can pose as potential problems… Tinsel, ribbons, and icicles if swallowed, can cause digestive blockages, possibly requiring surgery. Strings of lights and electrical cords, if chewed, pose the risk of electrocution, burns to the mouth, or even fire. So… if it gets too quiet, make sure you know where your Tibbie is and what he’s up to. It’s probably a good idea to leave the gift ribbons and bows off of the packages that you place under the tree until right before it’s time to exchange gifts. These are way too tempting to the ever curious Tibetan Spaniel and can be harmful to your pet if swallowed. Christmas plants such as holly (moderate to very toxic, especially the berries and leaves), poinsettia (leaves and stems low in toxicity), mistletoe (very toxic, all parts, especially the berries), ivy (moderate to very toxic, all parts) and hibiscus (may cause vomiting or bloody diarrhea if ingested) are beautiful and make homes festive during the holidays but can be very dangerous to dogs. Be sure to place these out of the reach of your Tibbie. Keep in mind that most Tibbies are climbers and will get on your table if given a chance. Not all Tibbies enjoy wearing clothes but some love the extra attention a cute doggy outfit can bring. A fancy dress or tuxedo and a trip for a photo with Santa can make Christmas fun for some dogs, while preserving a memory for the owner. 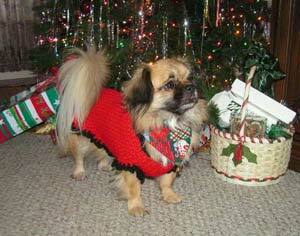 Pet stores and many online sites offer a great selection of dog clothing to choose from. Make sure the apparel chosen does not hamper your Tibbie’s movements or pose danger of him getting tangled up. Never leave your dressed up Tibbie along. Symptoms such as vomiting, gagging, diarrhea, constipation, lethargy or any change in behavior or appearance can indicate that the dog has been exposed to something dangerous and should be treated as an emergency.